This year NVAS held its Africa day in partnership with the School of Governance at Utrecht University (research area Sport & Society). The organisers were NVAS members Kirsten Langeveld, David Drengk and Froukje Krijtenburg with Frank van Eekeren of the UU School of Governance. In the audience were several professional athletes from Africa, other interested individuals from Africa, students interested in Africa from up North (Groningen), Africanists from various parts of the Netherlands, and many others with a passion for Africa. A photo impression of the day can be found here. The main question that was addressed during this day was how sport can be used as an instrument for positive social change in Africa. Other questions focussed on the interconnection between history, politics and sports relating to the problematic transculturation of surfing among black Africans in South Africa. Other themes discussed were sports and economy, and the role of indigenous games in African societies in the process of the formation of identities. In fact, the focus was both on sports and games in Africa, traditional board games to be precise. After the welcome and opening words of NVAS president Dr Felix Ameka and School of Governance Frank van Eekeren, keynote speaker professor Cora Burnett in the Department of Sport and Movement Studies of the University of Johannesburg passionately talked about sport as a catalyst for social change. 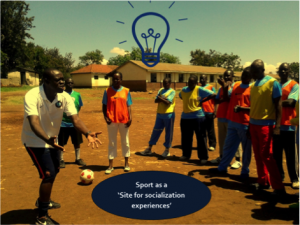 In collaboration with the German government and co-funded by the European Union, she is involved in a project that focuses on using football for development. Promoting social and organisational skills by participation or volunteer work, sports have made it possible for many deprived youngsters in South Africa to enter the labour market, professor Burnett argued. Additionally she underlined the importance of sport in creating self-awareness, developing a positive self-image and a social identity among poor youngsters. Her conclusion was full of hope: sport can and will indeed empower young people worldwide including those in Africa. The resear chers Uroš Kovač and Mark Hann of the ERC-funded Global Sport project of the University of Amsterdam focussed on wrestling in Cameroon and Senegal respectively. On the whole, they appeared to share Burnett’s opinion. Uroš conducted fieldwork in the Anglophone Southwest region of Cameroon, where he studied traditional wrestling matches of the Bakweri people. He found that the social networks of the wrestlers gives them a positive social identity. The wrestlers are highly respected in society for their sport achievements. This finding reminded me of Okonkwo, the main character in the novel Things Fall Apart by the late Nigerian (Igbo) writer Chinua Achebe. In this novel, Okonkwo wins a wrestling contest from the strongest Igbo man in his village, nicknamed ‘the Cat’. Once Okonkwo defeated this presumably unconquerable man, he becomes a hero. The wrestling game helped Okonkwo to build a reputation as a strong and masculine figure in contrast to his feminine and weak father. Okonkwo wants to be disassociated from his father and his career as a wrestler helps him to reach his goal. 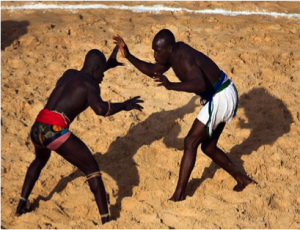 Wrestling is thus both empowering in the fictive literature of Nigerian societies and in contemporary Cameroon and Senegal. The anthropologist Uroš Kovač reminds us that, like everywhere else, sport in Africa has its roots in the sacred spheres of life rather than the profane. In the past, wrestlers were often members of secret societies with an indigenous religious orientation. Today, young wrestlers are less interested in joining these secret societies and especially the Pentecostals among them stress the secularity of the wrestling sport. For them, it is essential to detach their sport from all indigenous religious characteristics due to its clash with their Pentecostal beliefs. They believe that wrestling is not a traditionally oriented but a modern sport. The behaviour of these Christians enhances our insight on how modernity and the profane are negotiated in sports. Keynote speaker Frank van Eekeren closed the day with a lecture on the positive and problematic aspects of sport as a catalyst for social change. He stressed that Mandela’s maxim ‘sport has the power to change the world’ has so far not been academically supported. 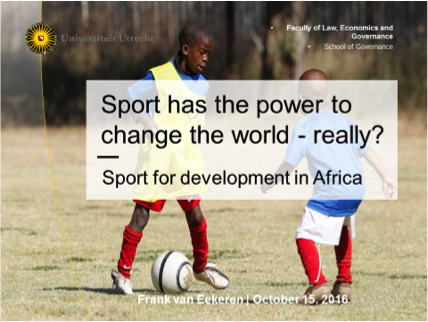 Sport can indeed have a positive impact on the lives of people including those in Africa, but sports are not a religion. Sports can include and empower people and increase their social capital as professor Cora Burnett demonstrated. However, it can also exclude and disempower them as Glen Thompson demonstrated in his history of black surfing. Sport can unite and divide, increase one’s health or cause injuries, create hope or cause despair. 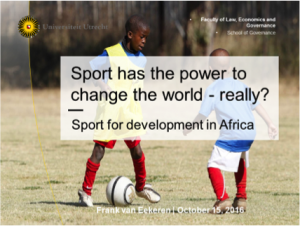 It is, therefore, most important for sport scientists not to evangelise sports but respectfully observe and analyse the traditional African games and sports and the transculturation of global sports in Africa.